The blogosphere has been abuzz these past few hours in anticipation for Twitter Music, which was due to launch today, April 12th. We all, quite wrongly, presumed we’d be able to give Twitter’s new audio streaming service a tryout for the very first time today, but while the site has gone live and looks ready to go, we’ll have to sit through another week of drumroll before it officially opens its doors. Some celebrities have been given privileged early access, with American Idol host Ryan Seacrest tweeting about how good it is, but for the time being, the mere mortals among us will have to wait it out in silence. 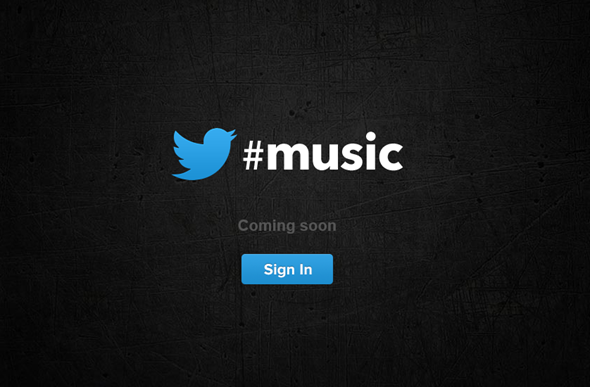 The landing page over at music.twitter.com has a dark, mysterious, yet exciting feel to it. Like the door to nightclub situated in the basement of a derelict building, it has the promise of exciting, musically-charged enjoyment behind it, but when you hit the sign-in button and opt to authorize the app, you’re just looped back to the same landing page once more. Considering Twitter’s position among the authority within the social networking scene, the company has somewhat dragged its heels in initiating a music service of its own. With the likes of Spotify and Grooveshark already leading the road and many others close behind, it will be interesting to see whether Twitter makes good use of its vast (and very active) user base to really make this music thing take off. From what we can gather though, this isn’t just a customary effort from Twitter. Yesterday, the company confirmed its purchase of We Are Hunted, a large music directory service which will no doubt help Twitter Music cut a few corners to begin competing with some of the established aforementioned services. So, the take home message is that unless you’re famous and or involved in the music biz, you’re probably not going to be tasting any of Twitter Music for the next week or so. With that said, we’ll be sure to let you know when it does finally begin accepting signups, so make sure you stay tuned to our coverage here at Redmond Pie! But putting all the fuss aside, do you think we really need another music service? Considering how well Spotify and Pandora is doing and with Apple’s iRadio service also rumored to launch this summer. You know where to drop the comments, so share your views with us.